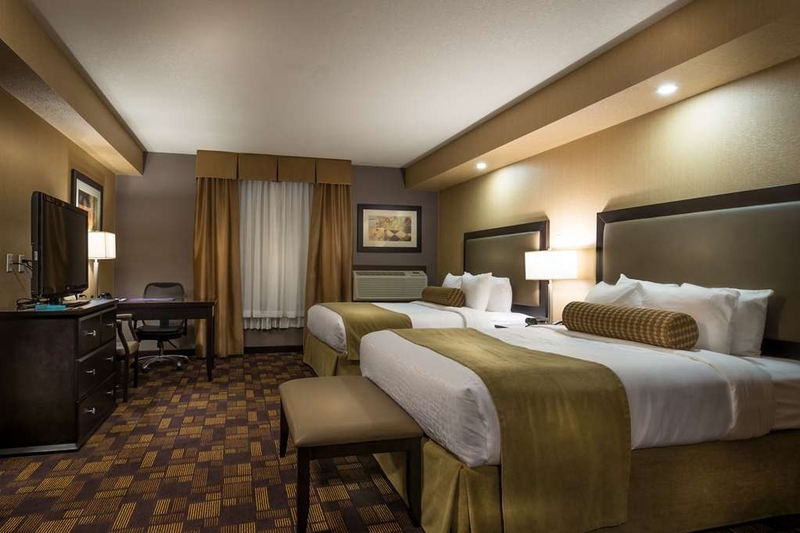 El Best Western Plus Fox Creek se encuentra en el centro de Fox Creek. Venga y disfrute de las mejores atracciónes turísticas cerca de nuestro hotel. Precios bajos garantizados y ofertas exclusivas. Alójese en nuestro hotel de Fox Creek, el Best Western Plus® Fox Creek, para disfrutar una acogedora estancia nocturna en esta magnífica región de la autopista a Alaska. 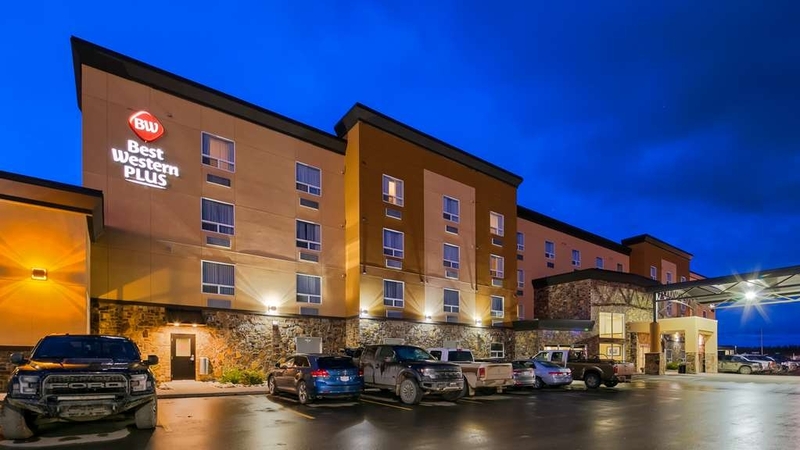 Situado a poca distancia de la autopista a Alaska y con un cómodo acceso a Grande Prairie y Edmonton, nuestro hotel hará todo lo que esté en su mano para proporcionarle una agradable estancia en Fox Creek. Comience su día de la mejor forma con un desayuno gratuito con huevos, fruta, café, pasteles y mucho más. Aquí encontrará igualmente una piscina y un gimnasio para mantenerse en forma. Si necesita realizar alguna tarea relacionada con su trabajo durante su viaje, nuestro hotel podrá proporcionarle todo lo que necesita con un centro de negocios con servicio de personal, computadora, fotocopiadora y equipo de fax. En las habitaciones de este hotel de Fox Creek podrá disfrutar de televisión por cable y acceso gratuito a Internet Wi-Fi. Muchas de nuestras habitaciones cuentan con hermosas vistas al paisaje de la zona, las montañas, el campo de golf o el bosque. 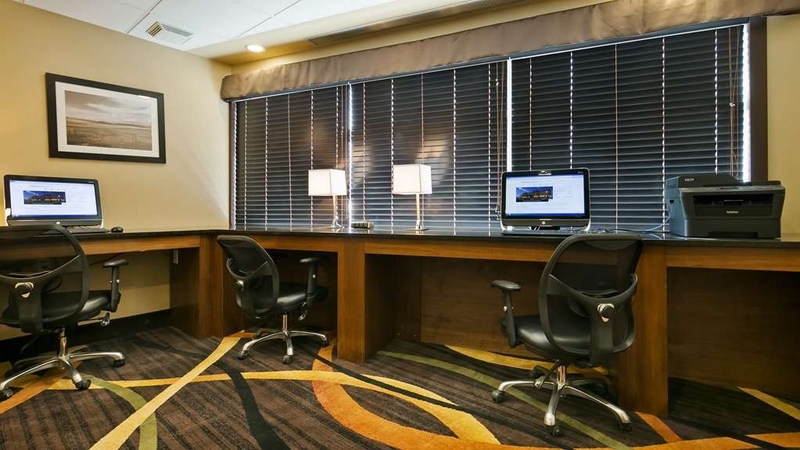 Estas ventajas son las que hacen que los viajeros escojan este hotel una y otra vez durante sus viajes a fox Creek. No deje de solicitar cualquier servicio especial que pueda necesitar durante su estancia. Habitaciones con bañera de hidromasaje y habitaciones con cocina pequeña. "Quiet, clean hotel - great staff"
First time at this hotel (business trip). Staff greeted me upon arrival, confirmed any needs I may have on check-in and were very courteous during my stay. Hotel was quiet and common areas were kept clean (not easy given how many of us may have been tracking in dirty boots after a day out in the field!). Room was clean on arrival, cleaned while I was out. And during times where I may have been waiting for others in the lobby, was pleased to see that staff greeted me instead of just ignoring me. Would definitely consider coming back here on my next business trip. My husband works out of town in Fox Creek and it is super nice to have a spot for us to be together when I come up to visit. Pool was wonderful, and I'm super impressed that the breakfast in the morning had gluten free options, as my husband is celiac. Comfort of the room was also quite good, and the staff was very friendly! 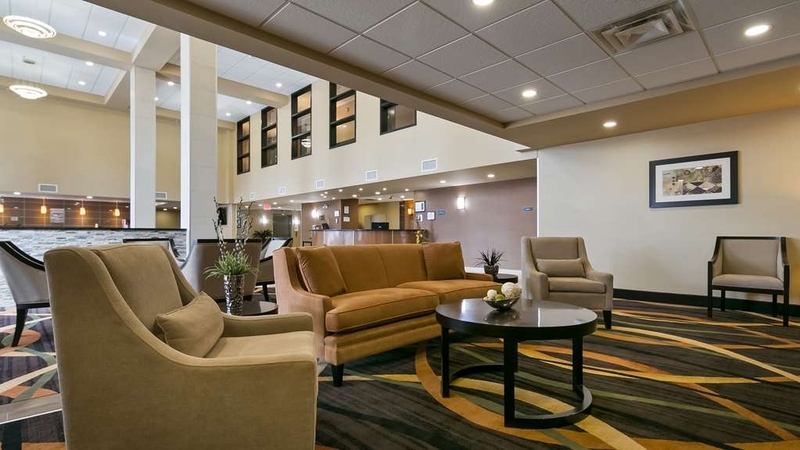 "Esthetically pleasing, friendly staff, lots of mud in the lobby though"
Great location and service. Staff very friendly. Breakfast variety was good. There's a create-your-own waffle machine. Pretty neat. Room is clean. Would have liked it better if the lobby can be kept clean with no mud. "I pretty much live there"
The only thing they could improve on is if they had a pub or restaurant there. There is little selection in the town and I can't see how it would hurt. Next time I have to remember to bring my bathing suit cause they have a pool and sauna there too! very nice hotel, they have a couple of larger rooms on each floor , and good assortment of regular rooms. price on high end but well worth it if you like an excellent free breakfast and quality decor. only down side is it can get quite muddy in the parking lot from the work trucks,but they do sweep regularly. Thank you so much for your review of our property. Reviews like yours mean so much to us. The entire team at Best Western Plus Fox Creek works hard every single day. 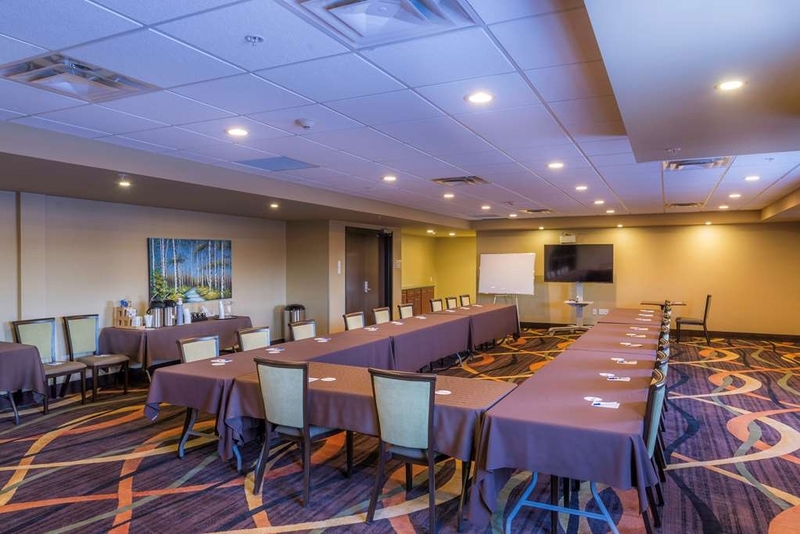 We strive to provide each guest with a great experience and we are thrilled to see we have given you superior guest service. Should you ever find yourself in our area again, we would love to have you stay with us. Wishing you safe travels, always. 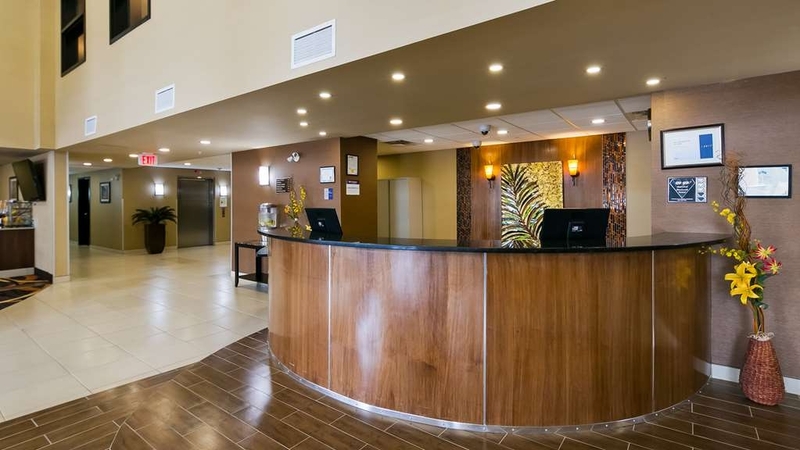 Very clean and well maintained, often booked up so I have to call a week or two ahead of time to get a room. Only swimming pool in town, which is great when the wife and kids come to visit, my first choice for a hotel. Thank you so much for your review of our property! We are very happy to have provided a safe and fun place for you and your family. We hope to see you again soon so we can have another opportunity to give you superior customer care. Have a wonderful day! I would suggest this hotel to anyone going through the area. A little pricy though. Otherwise close to amenitys and easy in and out. Breakfast was great and staff was helpful. Pool and sauna were working and that's a big plus these days. Thank you so much for your review of our property. We are happy to see you enjoyed your stay. We hope you will come back and see us again in the future. Have a wonderful day. Very good hotel but the staff need more professional attitude to talk and serve the guest during check in. Need to more focus and less distracted while talking with the guest during checking in, didn't acknowledge the Diomond member status and no upgrade room was available. .
Staff and hotel were excellent. Easy to find hotel with lots of parking. Close to service station and other restaurants. Very helpful staff made stay comfortable and easy. Moring breakfast room was clean and tidy with continental breakfast being enjoyable. Thank you Mr. Randy for filling out or survey. We thank you for the loyalty towards our hotel. We are glad to hear that your stay with us went excellent. We look forward to having you stay with us again in the future, so that we can continue to offer you superior customer care. Thank you again. Best Western Plus in Fox Creek. Great hotel a little expensive but that is because of the demand in the area great staff that do the best they can to help. The walls were a little thin or the neighbors were a lot noisy They would not settle down when asked by the staff. "very good, break fast is excellent, staffs are very friendly." Very good hotel in Fox Creek. Staffs are excellent. they are caring you all the times. The breakfast is very good quality food. I like to recommend my others coworker for staying this hotel. Swimming pool and fitness centre are not sufficient equipment but in this small town no complain. Had to pull over to stay in Fox creek due to bad weather. Rented both a double suite and king suite here for my family. Both rooms roughly $200 with bcaa membership. You're in the heart of oil country so you kind of expect to pay these prices. Nice faculty. Free wifi. 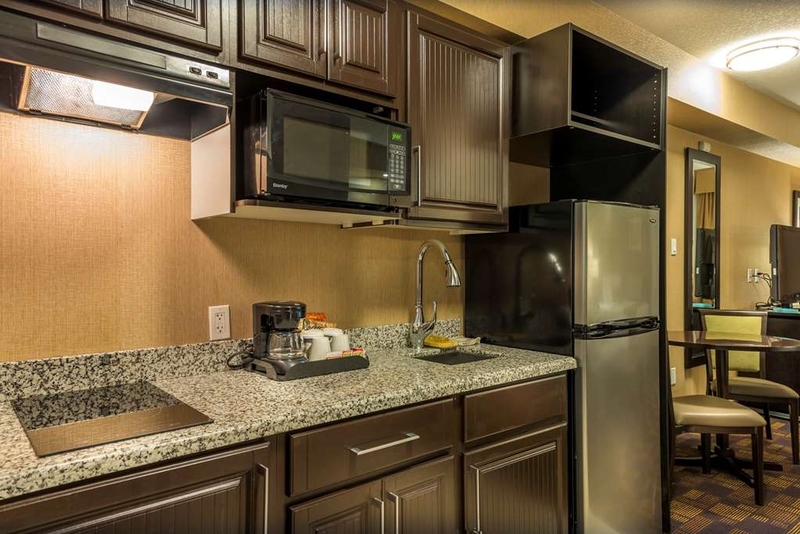 Continental breakfast is included and is well stocked. 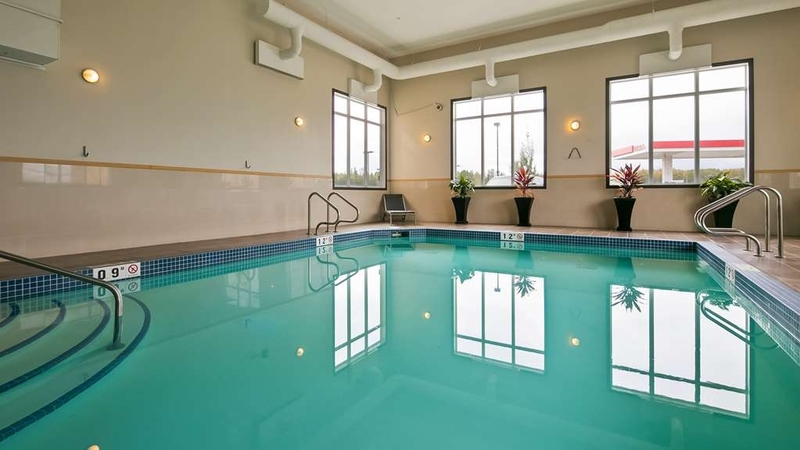 Pool, steam room and small gym facility. Relatively quite. Staff are friendly and hospitable. Easy in and out access and Gas station is close. Really not much to do here but get some sleep and head off. Glad we did. 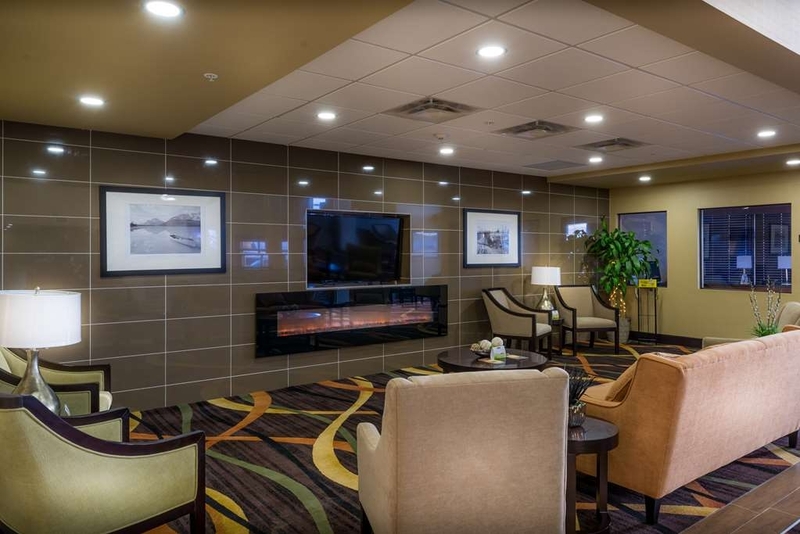 The best western plus can still improve on her services to valued customers. 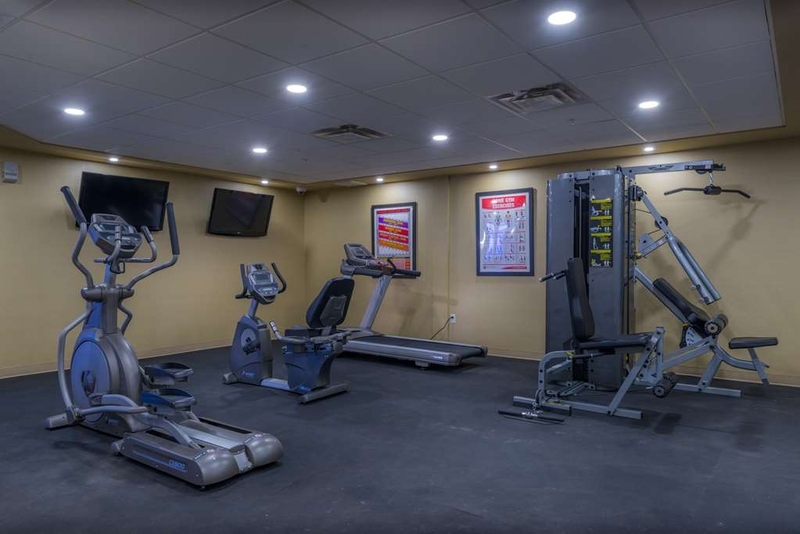 Good room internet and fitness facilities with a good water service can be some of the things that can be fixed. It will be great to feel welcome!! Clean, friendly and helpful staff. We were there for a family wedding and they were very accommodating to have us all together on one floor.The staff, very quickly, recognized us coming and going and made sure we needed nothing. I also left behind a couple of items and they were handed in to the front desk and waiting for a family member to pick up. Very Impressed. The morning staff at breakfast recognized me from previous stays and were very friendly and greeted my like a old friend which i appreciated. Rooms were nice and quite and at right temperature. Breakfasts were very good coffee was not the best a mixture of coca and coffee. I prefer a coffee black and taste like Tim Hortons coffee. nice hotel for business or work, it has alot of industry workers staying there and quiet impressed at how clean the staff keep the place, comfortable beds with nice spacious rooms. breakfast is a bonus and its easy to grab and go if on the run. Reserved a Non-smoking room but were forced to take a smoking room with a smoking door. Requested a late checkout but were harassed by Housekeeping at 9:15 and continued hourly. Morning Desk Clerk blamed evening Desk Clerk rather than changing herself. My kids and I spent 2 nights and the only complaint is the pool and sauna area. I don't think either are used or cleaned very often, so when we got in it was kind of smelly. Everything else was wonderful! Staff went out of their way to help with the entire stay, and breakfast was great! This has nice beds and pillows. Crappy pool and crappy Internet it is slow and choppy. They will charge a large amount on check in they tried $1700 but took $1000 off my credit card when I checked in Most expensive hotel in the town! "Worst stay of my life"
Unbelievably noisy from staff, brown water from the taps due to broken town pipe, couldn't bathe or brush teeth, no bottle water in room for the coffee machine ( no tap water) and was still full price! Classy room, new and clean. Price is high, but common for the area. Breakfast is basic but well stocked. Access to coffee and juice all night is a nice touch. 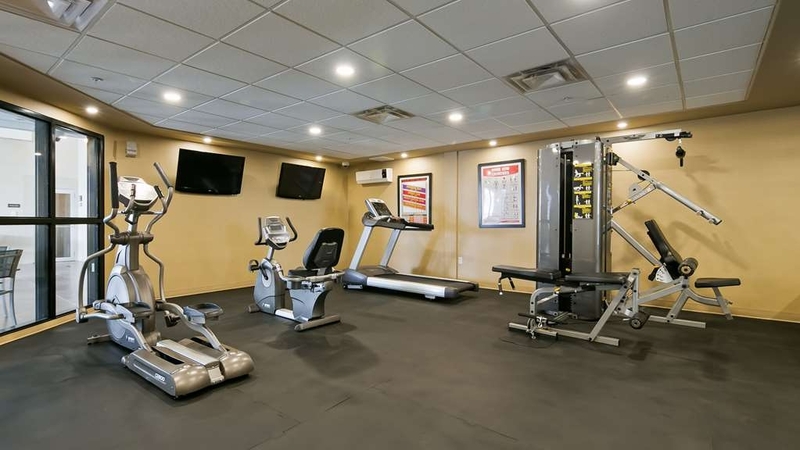 Nice pool, small weight room but the essentials. Business center is freezing (-20c outside). Staff super nice and helped me out with reward points. Very clean and comfortable place. I would stay again. Thank you for your wonderful review! Our staff here work very hard to try and keep all the mud out and our guests happy, with a home away from home attitude. We hope to see you very soon. "Great hotel for Fox Creek"
Rooms are on the expensive side, but not higher than other hotels in Fox Creek. Definitely the best quality in Fox Creek though. Steam Sauna followed by a dip in the swimming pool before bed is very relaxing. Breakfast was the microwaved eggs, but I found later that there were hard boiled eggs. It is fine. Clean and friendly. Every morning they kept putting on American news rather then Canadian news, so I had to ask them to change this. No offence, but CNN isn't exactly news worthy. Hello, thank you for your response. We appreciate hearing from our guests, it gives us a better perspective so that we can correct issues and make our guests stay much more comfortable. We have several different choices of eggs. If the ones we have for that particular morning doesn't appeal to you, you may always ask our breakfast attendant to make the kind of eggs that you choose. If we have the supplies on hand it is never an issue. "If you have to be in Fox Creek"
I was in Fox Creek for work, I was surprised at the amount of mud, but the staff work hard to keep the hotel clean. 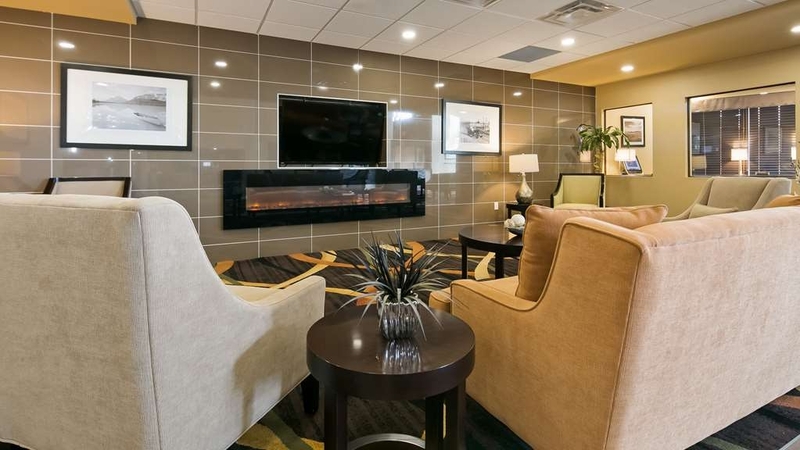 This is your typical best western, clean and nice staff. The hotel has nice kitchenettes and laundry. Complementary dinner for us there on Friday night was a nice surprise. I would recommend this hotel to any one going through or staying in Fox Creek. Thank you for staying with us, it was a pleasure. I will be sure to print off your review so we can all read it. Hope to see you soon again. 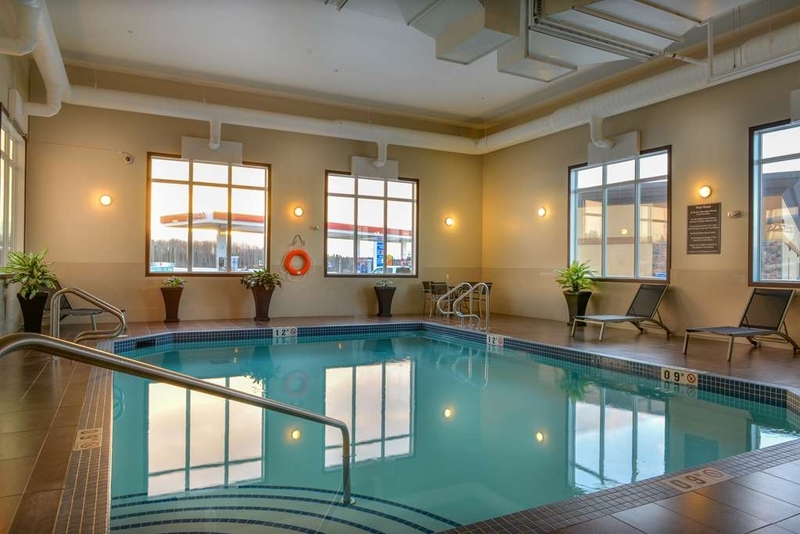 "Stayed for work but welcomed like home"
Came to Fox Creek for a temporary position and needed a good place to stay, glad to have found the Best Western Plus. 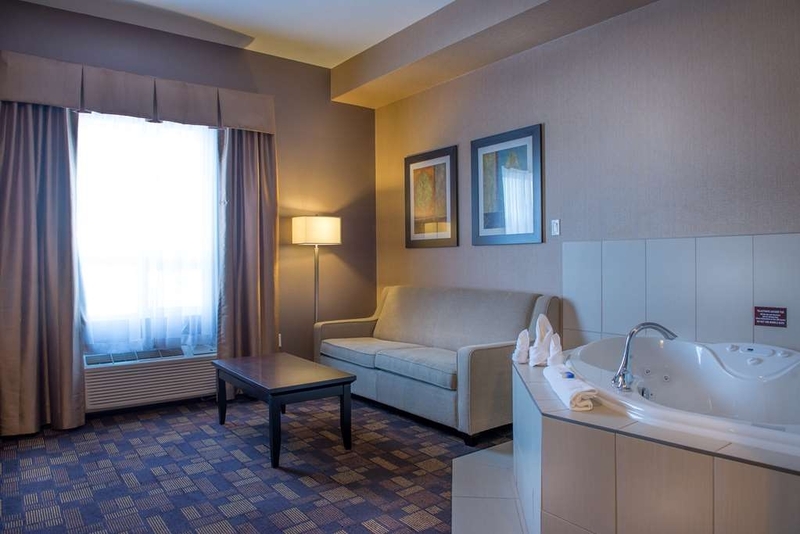 The staff is excellent and the rooms comfortable and clean. From check in to check out 4 days later a great stay. Checking in you will be greeted by Agnes on the front desk, the service was excellent and very welcoming. The room was very clean with a modern decor, housekeeping does a great job. Next morning you can enjoy a hot breakfast included in the price. I have already booked my next stay. If they fix the water pressure problem. This would be worth the money. But not at this time. The room was super clean, and very modern. But the water pressure problem is the one thing that you will remember. Even with the poorly designed rain drop shower head. Put some pressure behind it. I won't be back until they change it. "very modern + clean + pool + good wifi"
Very nice hotel. Clean, modern Quiet. I was quite impressed for a small town to have such a nice hotel. I was happy with the service and found the location ideal. I enjoy staying at the best western chain of hotels. They aim to please. As a traveler it is nice to have somewhere to count on. "DO NOT STAY HERE! " The first night they put me in a smoking room that they were going to "deep clean" and I wouldn't tell the difference, it stunk so bad the smell stuck to all of my clothes and I woke up having a hard time breathing. I had told them I have asthma but they didn't seem to care, the room even had an ashtray in it still. It was also the end of the world for them to move me to the kitchenette room my boss had arranged for the next night, made check in a huge hassle. The kitchenette room is alright, not worth the $215 a night they are charging my boss though that's for sure. I finally let the house keepers in my room on day 4 because I like my privacy but could use some fresh linens and a wipe down of all surfaces, all they did was half assed make the bed. They didn't replace the tea towel I had to use to wipe up a spill, counters were still dirty and the dish I had left in the sink was still there (every other hotel I've ever stayed in will clean that dish and put it away) but not this place. They don't have detailed Maps of the hotel so tomorrow when I go on a search for the laundry I'm sure it will be a task. I can only imagine what they charge! Update: The staff here cannot comprehend what a DO NOT DISTURB sign means as they have gone into my room twice now while I have had it up. After having my sunglasses STOLEN by their staff I told them I didn't want anyone going in my room but they still are. I am checking out tomorrow and we won't be using this hotel again, I advise everyone else to do the same. Not a bad hotel, but when I checked out I never checked the bill and found out later they had raised the rate for the last 3 nights of my stay. I was not notified of this and was quite upset. The breakfast was good, and hotel room was decent. This hotel is thee best hotel in fox creek. 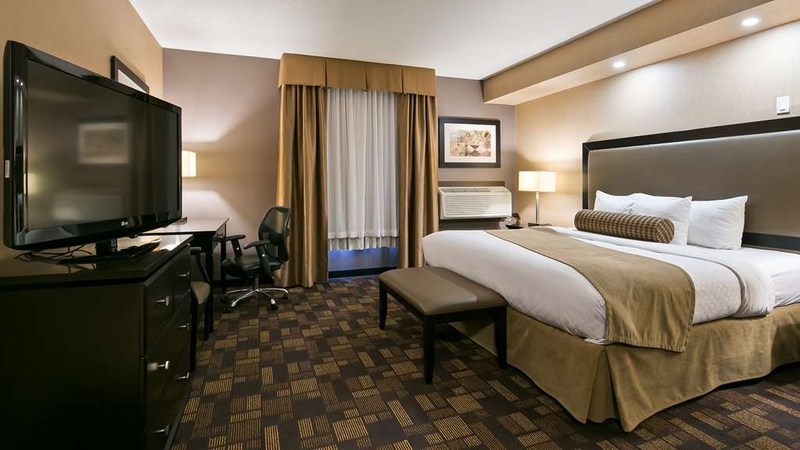 Very clean, super comfortable beds, very spacious and great pricing. The mananger lady is super awesome, she is very kind and meets and exceeds expectation. Staff is very polite. I would recommend this hotel to everyone. One thing that i wish they had was the BIG waffles for breakfast, everything else is very yummy. I will defenitly stay here again. Stayed here for 3 nights while in town for work. This hotel is awesome. The service was excellent and the staff were friendly. My room was very nice and in great shape. The shower is very good and the bed very comfortable. It was also nice that the free breakfast changed daily and was not the same every morning. The only thing I found to be a bit offputting is the fact that a corporate rate for a room is only $2 cheaper than the regular rate. To be fair this is a nice hotel and it was fully booked when we stayed there, so it obviously does not deter business. Nothing lasts forever though, and I would suggest to management that they mat want to take another look at corporate pricing. That being said, this hotel will be my first choice of places to stay in Fox Creek. "NEW HOTEL ROOM GOOD SIZE"
The hotel room was great....the front desk people looked very inexperienced and unable to answer any questions...Ask if they knew of good place to eat or for a Pizza place to deliver...handed me a menu...looked at it and the placed closed at 10 pm on a Friday. After tacking down something to eat on our own which as a sandwich made 3 day ago at the local store. We were unable to change the channels on the tv...called the front desk and was told by the young lady that a wire must be loose...by the sound of her voice she did not have glue what I was talking about. I would not stay in Fox Creek but not because of the hotel just because of the front desk people and the lack of places to eat later at night. I am so sorry that you didn't enjoy your stay with us. Unfortunately this is a quaint town and most places do close at 10pm. I did have our maintenance man fix the television, I do apologise we did not have him on hand to do that for you while you were here. Please print this email off the next time you come to stay with us and I will give you $50.00 off your room charge regardless of who you book it with. There will not be an expiry date on this. Thank you for your posting. "Everything great but the coffee sucked"
Who expects instant coffee made from syrup, produced by Nescafe...when staying at a premium hotel?? Not me, that is for sure. I expect a quality coffee, at least equal to what I get a McDo...that is not asking much...is it?? I am very sorry to hear that your stay with us was unsatisfactory. I can assure you that our coffee is a premium brand and not instant. We have had many compliments on our coffee from other guest, this is why we have the coffee that we do. 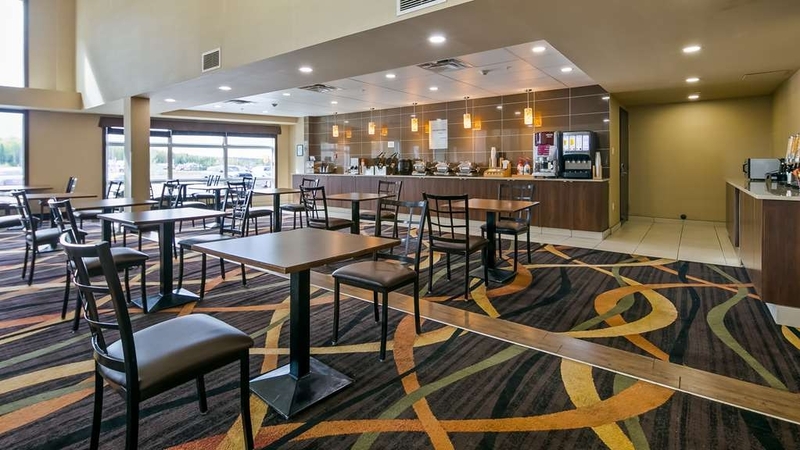 Excellent Hotel Staff and maintenance very helpful Wonderful comfort to beds and linen Super hot and cold breakfast Check in went very smoothly, also checkout fast and efficient Clean, very comfortable, good internet, service pleasant. 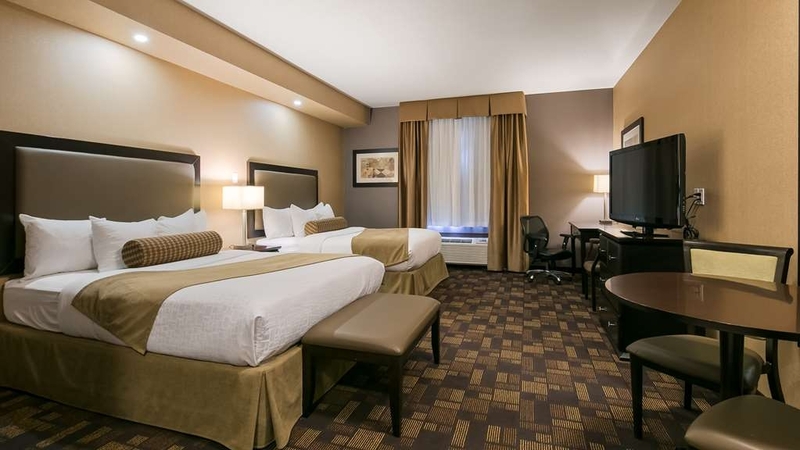 "A very nice and comfortable stay!" Great experience and it was a nice choice to go with this hotel. Newly built and everything looks so neat and clean. The staff was helpful and the menu on the breakfast was good too. Definitely has my recommendation for anyone looking to stay in Fox Creek. Very nice rooms. Good hot breakfast. My reservations were wrong. Nice place but over priced!. That's why only one star. There are better prices at other hotels and just as nice. I have nothing else to comment on.